One of the few things I miss from the years when I used MS-DOS is WordPerfect 5.1. It was a perfect application for writing and few WYSIWYG word processors if any have been as userfriendly as WP was. For the last seven or eight years I've been constantly looking for a perfect word processor. I have used KWord, Abiword, OpenOffice, LyX and even Emacs for writing. Sometimes, I have planned to install a copy of WordPerfect under FreeDOS just to recreate the simple desktop with no distractions like Firefox. But there were, of course, things like Tetris and Civilization that sometimes kept me from writing for days. 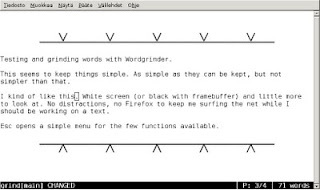 Today I decided to test yet another Linux word processor -- WordGrinder is probably the one and only console mode word processor that exists for Linux. It is as simple as it gets, but not too simple. WordGrinder uses a binary format for its files, which makes them unreadable for ordinary text editors. It can, however, export the files to plain text and html. The latest version (0.3) should even export the text to LaTeX and troff for the geekiest users. Unfortunately, my Debian still has the version 0.2 that does not support all of the fancy stuff mentioned in the web site for WordGrinder. Although I should point out that 0.2 is seriously ancient and has quite a lot of bugs. Including at least some instacrash bugs. I've been using WG a while and it's great. I normally type in WG and then cut and paste into abiword for any detailed formatting, and I use aspell as a spellchecker. If that sounds overly complex, it's not. I find this method far more productive and lighter on resources. This article has been added to the library.